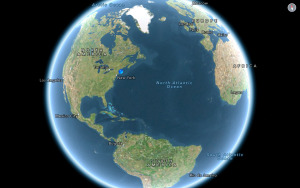 The arrival of Google Maps for iPhone late last year was heralded with much fanfare, due in large part to Apple’s own underwhelming Maps. But one shortcoming in Google’s offering was the lack of any support for the iPad. Earlier this year, at its annual I/O developer conference, Google demoed an update that included support for Apple’s tablet, which it said would arrive later this summer—and, judging by the sweltering heat I’m sitting in, the company hit its mark. The update, which drops for both iPhones and iPads on Wednesday, brings most of the same improvements that rolled out to Android users last week. Improved discoverability of places is one feature that Google’s been trumpeting in this update. A new Explore feature lets you quickly search for specific types of locations; tap in the search field, and then tap on the Explore card to bring up options for Eat, Drink, Shop, Play, and Sleep. Each of those is divided into a number of sub-categories—so, for example, under Eat, you’ll find restaurants, fast food, bakeries, ice cream, and so on. Tapping on any of the categories will then show you cards—Google’s big on cards—for the sub-categories, each with nearby places that fit the bill; you can tap ‘View’ all for a full list of those types of places. The new Explore feature lets you find nearby locations in a variety of categories and sub-categories. In another improvement, Google has standardized its review process, so that each location now has a simple rating of one to five stars, alongside content that Google pulls in from Zagat. The company’s also integrated Google Offers, which provides deals and bargains from certain brands, though I haven’t yet encountered any. Google’s also changed up the list of quick-access shortcut icons it offers: It now lets you search, by default, for grocery stores, pharmacies, banks, and gas stations instead of restaurants, bars, and so on, which are now covered by Explore. (A much longer list is still accessible, though I wish they’d make the first slots more customizable). As per iOS 6's own Maps, Google Maps will now show you live construction alerts and traffic incidents. Lest you think that mapping has fallen by the wayside here, there are a couple of nice enhancements to navigation. For one, Google Maps now includes a bicycle layer that shows you biking paths in your area, highlighted in green, and offers turn-by-turn bicycling directions. And, in a rare bit of catching up with Apple Maps, there are now live listings of traffic incidents and construction—tapping on one will give you details. Perhaps the niftiest new feature—on a scale of one-to-nifty—is Google Maps’s new indoors mapping feature. No longer do you have to wander around your local mall or an unfamiliar airport, trying to figure out where a particular shop or restaurant is located: Google Maps has that information baked right in—if you zoom in far enough, you can even toggle between multiple floors. However, some of this info is spotty right now—one of my local malls showed only an incomplete floor plan. 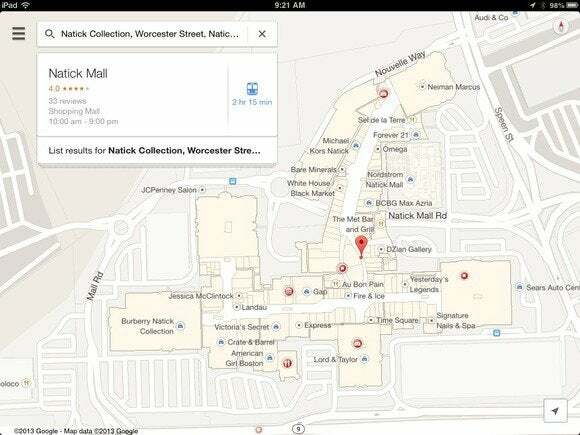 Indoor mapping means never again having to wander around until you find a Directory kiosk in your local mall. While the iOS version of Google Maps for the most part maintains parity with its Android counterpart, there is one notable omission in the iOS edition: On Google’s own platform, Maps will automatically route around traffic problems. That’s not available in the current update for iOS, but Google has intimated that it’s due to come, uh, down the road, if you will. Just in case iOS-based mapping isn't your bag, you can also check out the new and improved Google Maps interface on the Web, which the company made available to all users on Wednesday.